Well, if I took it seriously it would. Luckily I'm jaded enough to know better than that. For the second time in my 4.9 years at Yahoo, I have the pleasure of taking part in one of their self-assessment systems. To start, they send you an e-mail message (and by "e-mail message" I mean word document attached to an empty message with a vague subject line like "Gallup SF34 E-Learning" instead of "Instructions for completing the Gallup on-line assessment"). This is the beginning of a journey of strengths discovery that has the potential to enrich your personal life and accelerate your professional growth and performance. Through this process you will gain valuable insights about your own best formula for success and acquire a new language for talking about talent with other people at Yahoo!. And that's where the gag reflex begins. Having been subjected to their "Strengths Finder" self-assessment before, I'm less than excited about this "journey" and how it's likely to "enrich my personal life". In reality, it's like a standardized test with 180 questions. The differnce is that you spend time trying to answer multiple choice questions when, in reality, the best answer is rarely even there. So you either have to approximate or make a selection based on what you think they're after. And you're not really answering them as much as you're stating some vague notion of a preference. And you have only 20 seconds to decide on each question. 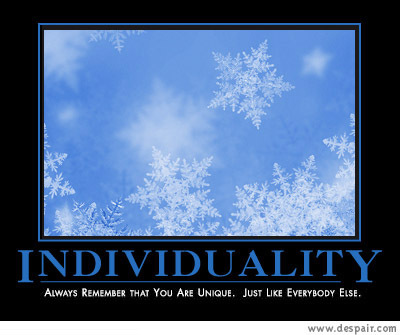 Then, when the results come, you realize that you're just like unique--just like everybody else. Maybe this time around I'll post the results here. That could be amusing. I don't know about you, but after I fill out one of those on-line forms, for some reason i always expect to find out that I'm most like Justin of the Back Street Boys. We'd like to give you a raise, JR, but we're looking for more "A.J. "s this year. Some companies make you fill out TPS reports, some make you fill out self-evaluations. Makes you wonder what HR genius approved the idea of using this kind of self-assessment quiz, how much Yahoo paid for it, and how much employee time is wasted agonizing over. Go on Jeremy - why not post some of the questions? My curiosity is roused. Oh - and aaaaaahhhh - make sure you put a cover on all of your TPS reports in future,mmmmkay? I did some consulting for a UK "property portal" some years back, in a nutshell their business was listing residential properties for sale. Being somewhat in the market research business, I have heard many times that what people will mostly value is research that quantifies what they already believe... so a poll that says that the people who visit a real estate site are thinking of moving is probably a good thing... to them. A friend in Congress once told me the story of a predictive polling company that was so good that it failed... no politician will continue to pay for polls that tell them things they didn't want to hear. Nick - i have to slightly disagree with you there. Its well known that Tony Blair has his own PollMeister - Philip Gould - who analyses the polls and conducts constant focus group surveys. Blair certainly hears about it if a certain decision is unpopular. This is where he (Blair) falls back on being the "leader" thing - doing unpopular decisions because he feels they are the right thing (in his view) in the long term. But Blair and his circle ARE avid poll watchers AND indeed poll diggers too - far more so than any previous UK administration in history. Of course, your mileage varies in the U.S. I also believe that in an employee/employer "survey" the employee's tell lies and the employer wants to believe those lies. I'm as small time as small time gets but I know one thing, as we sit there at interview and ask what is a simple "self-assessment systems" question; "how is your time keeping?" nobody has ever said...very poor, I tend to lick it bad at the weekends and attendance may be patchy on Mondays. You missed the real test, it's just an elaborate test to see who is idle enough to fill the damn thing out. blargh! I hate crap like that. "Would you rat on your best friend if he stole something from the office?" I had a friend take the test to be screened by a parochial school district and the test had 100 questions that she had to answer in 30 minutes. That means 20 seconds for each questions and if you missed two questions in a row, they automatically shut the test down! They asked all sorts of personal questions, which she declined to answer. The test was geared towards public schools but this was a religious school, so most of it didn't apply. This woman is an excellent teacher who has taught for 26 years--and this test will tell her she can't teach in this district? That sounds like some of the current problems in certification which wouldn't allow someone like Colin Powell to teach history because he doesn't have a certificate. Or a doctor couldn't teach science or anatomy and physiology because she doesn't have a teacher's certificate. Something is wrong here. 1-Teachers are supposed to be thoughtful, careful thinkers who approach each teaching situation with the students and fellow workers and parents in mind so they can do their best for each family. This test does not measure that. You have to be a speed reader (since when is that a requirement to be a good teacher?) and make snap judgments. When taking state certification tests, the person gets up to four hours to answer the questions. And you can't go back to a question if you missed it or want to change your answer. 2-The applicants never get to see their test scores. How can that be legal? When taking state certification exams, when the results are completed, each test taker gets a detailed copy of the grades divided into sections so they know exactly where their strong and weak points are. I think these tests are unprofessional, unethical and downright awful. To use this to decide whether a teacher will teach in this particular district is appalling: what if the teacher has dyslexia? And with the current and future teacher shortages, how can anyone do this to perfectly good teachers? Any information anyone can give me that will help me stop this practice would be appreciated. Next day he was informed that he had to go on line and take a Gallup. It took around an hour. Questions like, should someone leave their personal life at home???? Do you find it easy to talk to people you don't know??? ( He's a saleman for God's sake) Do you consider youself punctual? Do you hate to be late? He recieved an email last night that he did not pass the "test" and would not be offered a job. In 2 weeks we are homeless and he is jobless. Someone should be made accountable for this ridiculous survey. What happened to looking at a guy's track record with the company for God's sake? Comments appreciated. Regarding the woman whose husband lost his job because he didn't pass their stupid test. Maybe those who have had the same experience should get together and file a class action suit against Gallup. Or how about finding other employees from this company that had the same experience and have them get together and file the class action suit against the company. This family needs to find a lawyer and sue that company. If they didn't tell him before that he had to take the test, something has to be very wrong. Find a good lawyer who specializes in labor disputes and who only gets paid if he wins. If nothing else, they can get a sizable settlement from them. But, better yet, they need to make that company stop giving that **** test. oh dear GOD I was looking for information about this Gallup test before I took it for this new job. Now I'm just plain scared. I took the test recently and they asked "what number do I think about throughout the day?" i am sorry, my position does not consists me thinking of numbers all day? I work in a field that I am passionate about, isn't that enough? I just took that Gallup teacher assessment test on line for a school district I am applying to. I agree with you about this kind of assessment. Many of the questions could not be answered in 20 seconds, and there could have been more than one answer. I found it kind of demeaning and stupid. I prefer face to face interviews, how can multiple choice questions of that nature, truly tell you what kind of teacher you will be and who you are as a person. Do you know how we could find out how we did? Do I have the right to request my results from Gallup? Listen the companies that use this kind of instrument the way it was intended would not 'fire' you from your job because you did not pass the test. There HAD to be something else behind it. These kind of tests can be valuable when placing people in the environments and with individuals with which they will perform their best. There is no right or wrong answer. I worked for a company that used a very crude form of a similar test and would hire people who would perform best in the environment we had. If you were a talkative, indirect person you would not fit in our accounting department and probably quit. That is what companies are trying to avoid - turnover - if you don't fit you won't stay. So find a company that you do fit with. Don't take it personally. THe key is to take your weaknesses and turn them into strengths and when you interview focus on your strengths and how they can benefit the company. Don't fall prey to random people scaring you into thinking that your personality is bad compared to someone elses. It's just different and it's ok!! Find a place and the people you like and you'll be happy. HARMONY - The manipulating ability to CONSISTANTLY WOO ( Win Others Over ) by POSITIVELY COMMUNICATING ones point until all others cave to ones will. I cannot wait to take this test so I can be a big phony too. I told her to have her boss get a desk ready for me since I too will have a top 5 strengths which apparently is better than any interview. Strength Finder is meant to help people look for careers and jobs that are fulfilling. It helps individuals focus on their top strength instead of getting stuck in a job they hate, doing things they absolutely hate. It is better for the employee and it certainly helps the organization too. This assessment was created with years of research to back it up by people with doctorates. The Living Room Battle is about Search?